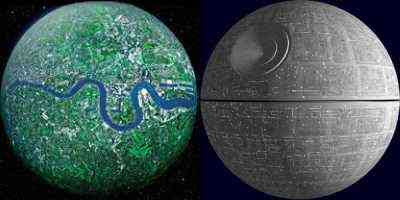 Here's the reason I find the graphic of Planet London so bleak: it reminds me of the Death Star from Star Wars! I've put the two side-by-side so you can see what I mean. Is this the best way of attracting foreign punters to the old metropolis? Imagine Darth Vader played by Mayor Bouncy Boris with that rich, fruity, public-schoolboy accent. Naw. But what about PM Gordon Brown as Chewbacca? Perfect casting.